Lay out bacon on a parchment-lined baking sheet. Cook in the 375 degree oven for 20-30 minutes (depending on thickness of bacon) or until the bacon is cooked but not crispy. Drain and set aside. Reduce the oven temperature to 350. While the bacon cooks, shred your cheese and prep your vegetables. Shortly before you take the bacon out of the oven, bring a large pot of salted water to a rolling boil. Add pasta and cook until al dente, about 10 minutes. Drain, return to the pot, and cover to keep warm. In another large, heavy-bottomed pot, melt 6 Tablespoons of butter. Add onion and cook for 5 minutes or until just tender. During the last minute of cooking, add the garlic. When the garlic begins to release its fragrance, add in the mustard and flour to form a roux. Whisk to combine, and keep stirring and moving the roux for about three minutes. Add the milk and paprika. Whisk until all lumps disappear. Continue cooking at a simmer for 10 minutes. Gradually, stir in the cheese, salt, and pepper until the cheese has melted. Remove from heat and stir in the bacon and jalapeño slices. Then fold in the pasta. 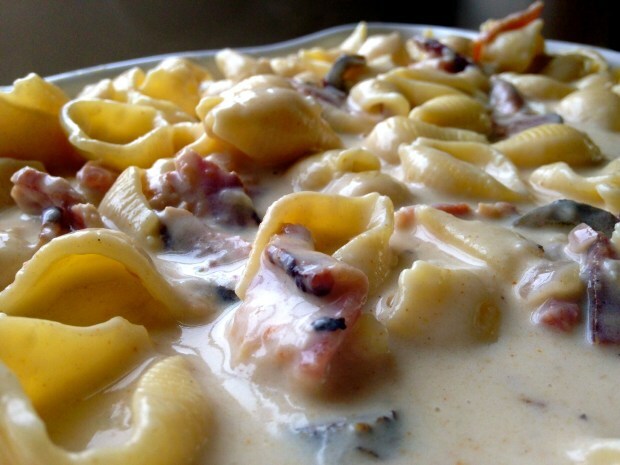 Pour the pasta and cheese mixture into a greased, large, deep, baking dish (mine measures 12″x8.5″x3″). Set aside. In a frying pan, melt 2 Tablespoons of butter. Stir in bread crumbs until coated. Scatter the bread crumbs on top of the pasta and cheese. Top with 1-2 teaspoons of chopped pickled jalapeños. Bake for 30 minutes at 350 degrees or until the top is golden brown. 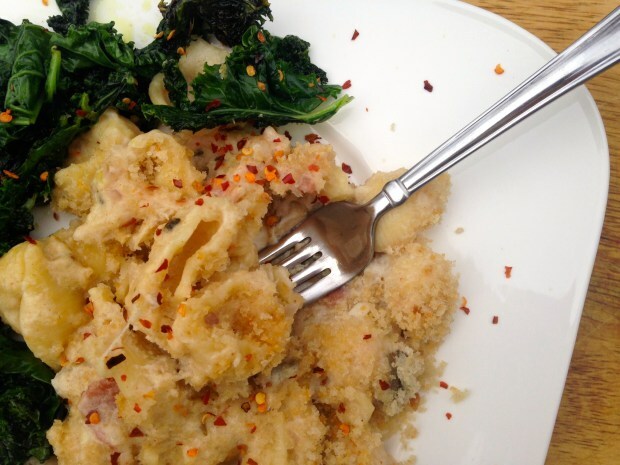 Serve hot, with a sprinkling of crushed red pepper if you like, and a side of braised kale…to make you feel better about the 9 Tablespoons of butter. I had an assortment of cheeses left over from my birthday party, so this was hardly an exact science. Feel free to use what you have on hand or what you can find at the grocery store, but try to stick to the same ratio of hard cheeses to soft. Also, avoid cheddars, blues, or strong goats. The Beemster I used is very mild and slightly nutty. 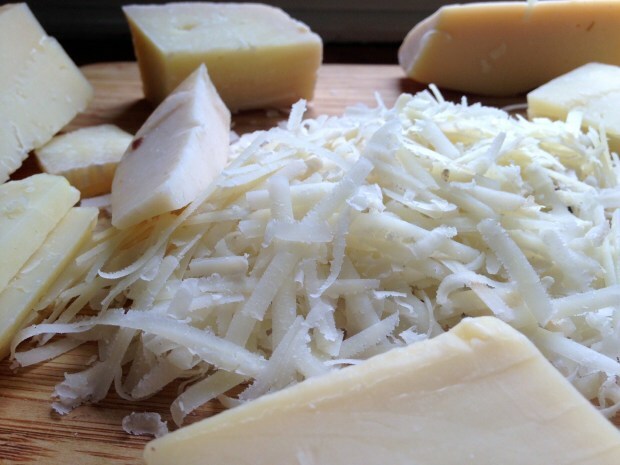 Other hard cheeses to try would be Asiago, Parmesan, or any good hard Spanish or Italian cheese. Other soft cheeses could be St. Andre or gruyere. Again, not an exact science. The trick is keeping any one cheese from dominating (and avoiding cheddar!). You can find pickled jalapeños in most specialty food stores. If you grow about two thousand of them in your garden and are desperately looking for ways to use them, you can also make them easily and cheaply at home. They’re typically less spicy than the fresh from the garden ones, but still have a great kick. Use more or less depending on your spice preferences. I used small shells instead of macaroni because I don’t like macaroni noodles. Also, it’s fun when the shells fill up with cheese and you bite into the equivalent of a little cheese pocket. Any kind of small thick noodle will work, though, so if you have something different on hand, don’t sweat it. You could try to make this less caloric or lower in fat…but that would be like trying to make the sun less yellow or the grass less green. Pure silliness. Just schedule in time for an extra long walk that day or the next. That makes it a win-win for everyone.